A white supremacist, front and center at the rallies in Charlottesville, Virginia, is from Keene, New Hampshire, and his neighbors are shocked. Most residents in the city are appalled by Chris Cantwell's extremist views, but few people are more surprised than his landlord. "He never showed that personality to me," Todd Tousley told NBC Boston in an interview outside Cantwell's apartment Thursday. 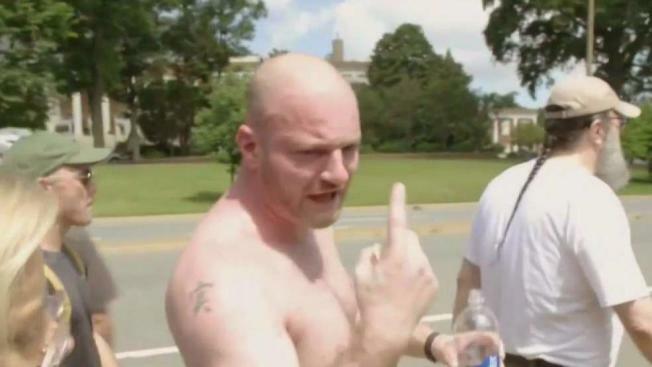 Tousley couldn't believe his eyes when he saw his own tenant on a Vice News documentary -- featured as one of the leaders of the white supremacist rally in Charlottesville. Cantwell has lived in Keene New for about five years. But residents want to make it abundantly clear he was not brought up here. "That's not New Hampshire, that's not what we are, it's not American," said Ian Hoppock, who calls Keene his hometown. "Shocking and shameful, it breaks my heart," said Keene High School Teacher Jennifer White. "The fact that nobody on our side died, I would call that points for us," Cantwell said. "That's one of the most repulsive and sickening things I have ever heard," Hoppock said. "It seems we have absolutely gone to the point of self-destruction," said Gardner, Massachusetts, resident Kathleen Innis, who was visiting Keene Thursday. In a YouTube video posted Wednesday, Cantwell is in tears, blaming the weekend violence on the counter protesters. Tousely thinks that latest video shows his tenant's true colors. "I have a feeling deep down inside, he doesn’t really mean it," Tousley said. "It's like a mob mentality." Cantwell didn't return our calls or emails for comment, but he did post in his blog Thursday. He says there is a warrant out for his arrest in Virginia and he plans to turn himself in. Cantwell says he's staying in an undisclosed location because death threats have him fearing for his life.